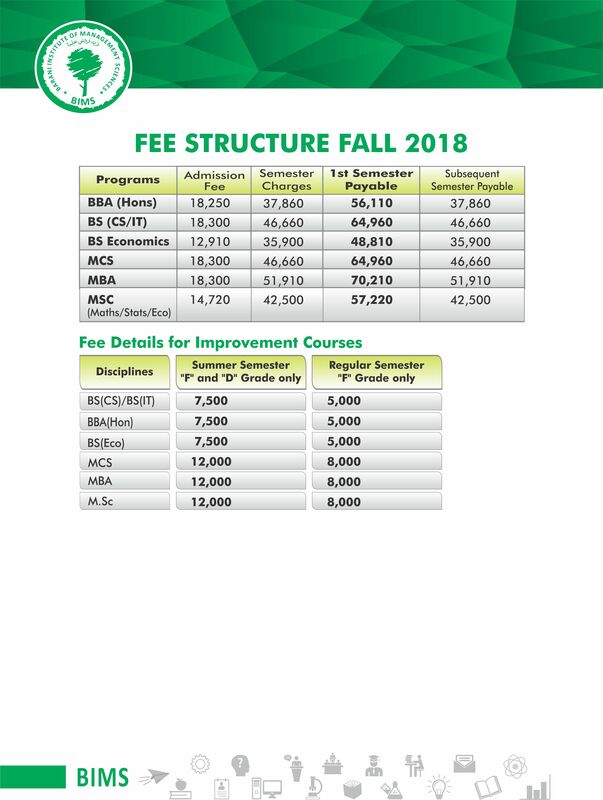 Barani Institute of Management Sciences Rawalpindi complete fee structure avail here. Barani Institute of Management Sciences (BIMS) strives to provide an intellectual and dynamic environment for creating an exemplary institution to provide quality education. BIMS established in 2013 with the aim of providing a high-quality education to our students in fields of Management Science, Computer Science, Social Sciences etc. Barani Institute of Management Sciences is a national level institute which provides quality education in the fields of Computer Sciences, Management Sciences, Mathematics, Statistics, Economics in highly conducive, congenial, and complaisant milieu. The highly qualified and competent faculty is a hallmark of this institution which trains the students with complete devotion and dedication enabling them to successfully compete with other professionals at any level. The objective of BIMS is to groom the youth to their fullest capacity to face the challenges of the market in their fields of interest. The classrooms, laboratories and other facilities are well furnished, fully equipped, and properly secured, besides having neat, clean and air-conditioned environment. BIMS provides excellence in teaching through various comfort zones; ranging from conductive teaching environment by providing air-conditioned class rooms, elaborate workshops and laboratories and rich library. Arid Agriculture University has experienced remarkable growth and is offering undergraduate as well as graduate degree programs in variety of disciplines. You can check complete Merit list of BIMS online free from here. As ranked 5th amongst all the Universities of Pakistan, with remarkable reputation, highly qualified faculty, research work and external linkages. BIMS aims to prepare outstanding intellectuals individuals, and scholars, able to think out of the box to face world’s challenges and solve societal problems. As BIMS is following the footsteps of Arid Agriculture, providing high-quality education, conducive teaching environment, with highly qualified faculty, and diverse labs.